Getting bored with your phone and is a Star Wars fan? How about playing Star Wars themed pinball game, for free? The popular Star Wars Pinball 5, published by ZEN Studios, has its price dropped to zero (0), making it essentially a free app! Star Wars Pinball 5 normally has a list price of $1.99. Star Wars Pinball lets you interact with the most iconic characters, and relive the greatest moments of the Star Wars universe mixed with exciting pinball action! 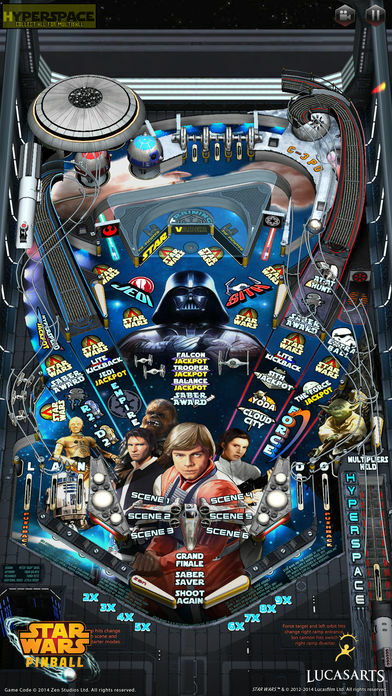 The initial Star Wars Pinball download comes with the Star Wars Episode V: The Empire Strikes Back table, though you can add more tables from Star Wars Episode VI: Return of the Jedi, Darth Vader, Starfighter Assault, Star Wars: The Clone Wars, and Boba Fett through in-app purchases. The player also can choose to support the Galactic Empire or the Rebel Alliance with your high scores as the Star Wars Pinball community fights for the Balance of the Force! Experience authentic Star Wars moments, sounds and characters! Friend challenges and in-game score notifications! Detailed table guides to help you achieve a higher score! Choose to support the Light Side or the Dark Side and help determine the Balance of the Force! The free Star Wars Pinball 5 is available on iOS, Android and Amazon. For Android Play Store and Appstore for Amazon, you can get the free game through web browser, and it will automatically add to your library. For iOS, you have to open the App Store to get the game. You can open the app stores of all mobile smartphones and search for the game to install it too.